Planting an orchard is a dream we’ve always had. 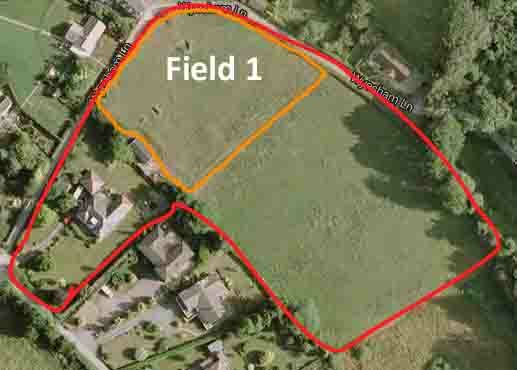 We decided early in 2015 that we would use field 1 and plant some fruit trees straight away. The ground is gently sloping and faces the sun all day. It is well drained but the soil is quite heavy in the field. 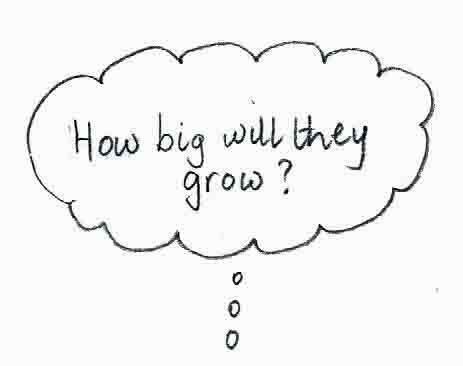 A large number of questions loomed due to our lack of knowledge. The planning however is all part of the fun. 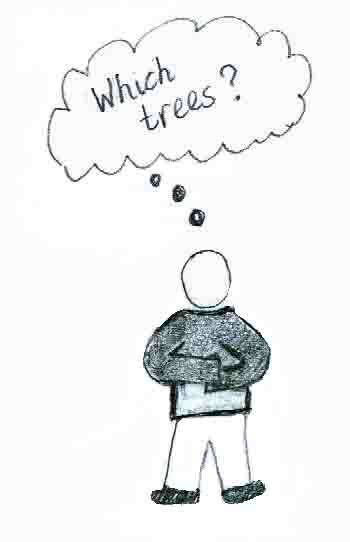 Which trees should we choose and why? Where should we purchase them from? Which rootstocks should we choose? How old should the trees be? How should they be planted and what should the spacing be? Do they need staking, protecting? Should we pay someone to plant them? Answers to some questions prompted more questions as we discovered and learned more about planting an orchard. 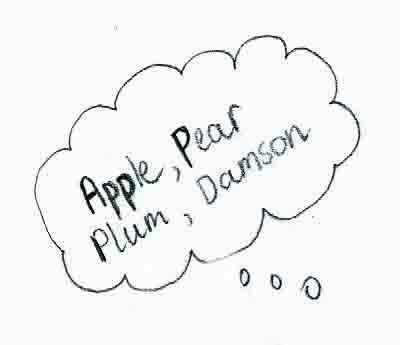 For example pollination questions and the need to choose ‘compatible’ apple trees. 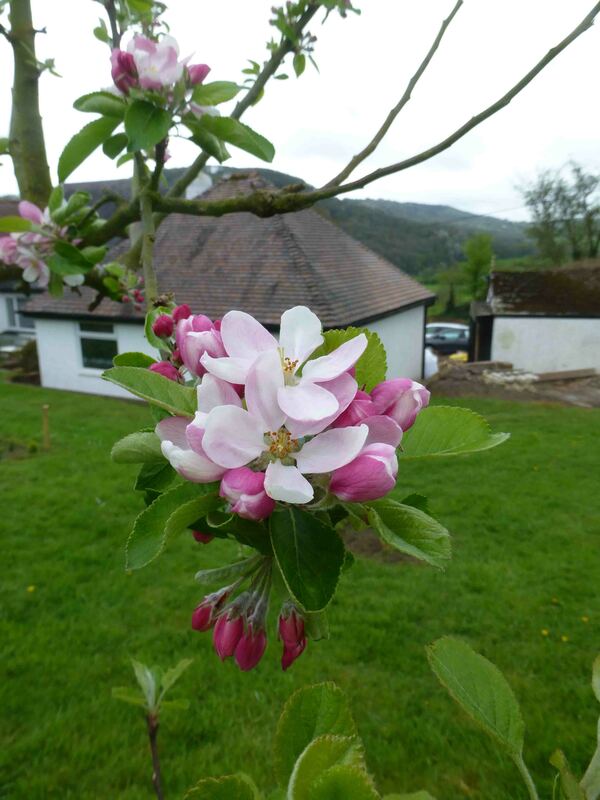 Most apple trees need another compatible apple tree (which must be of a different variety) nearby in order for the blossom to set fruit and produce apples. The key to proper fruit tree pollination is timing. For example: any early-season variety will pollinate another early-season variety. 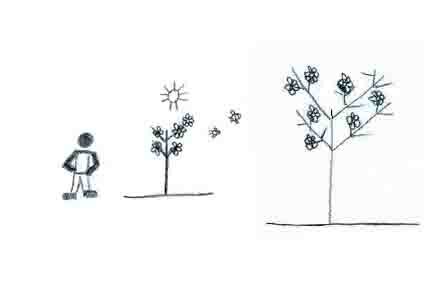 So if you’re only planting 2 trees, it’s best to plant trees that will bloom at the same time. Which trees should we choose? 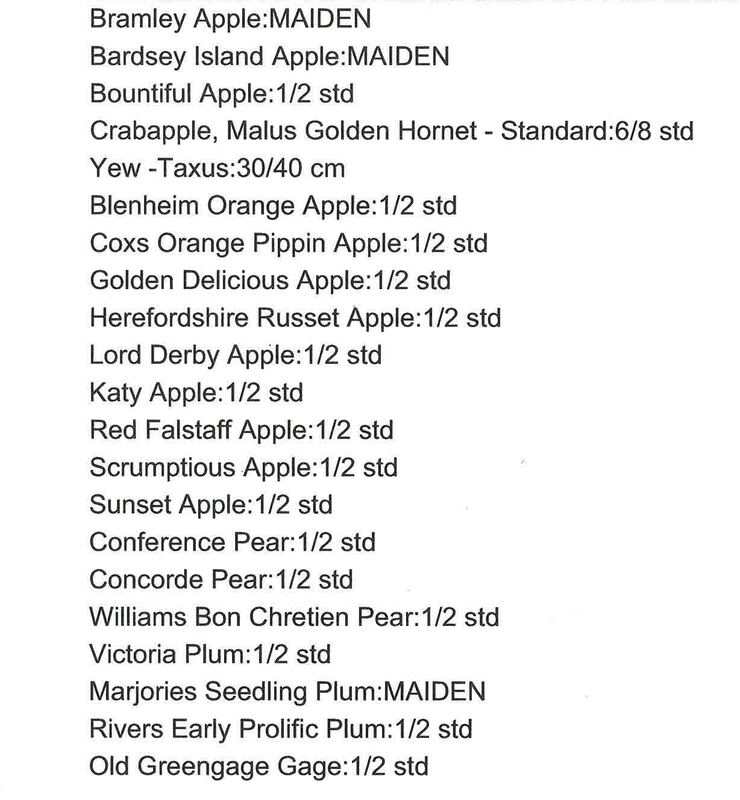 Not knowing many varieties of apples, we decided to email a few nurseries to see what they suggested for a small orchard of around 30 trees, giving them our location and land aspect. Some favourites we definitely wanted were Cox, Russet and Bramley Apples; Pershore and Victoria Plums; some Pear trees and a damson variety. 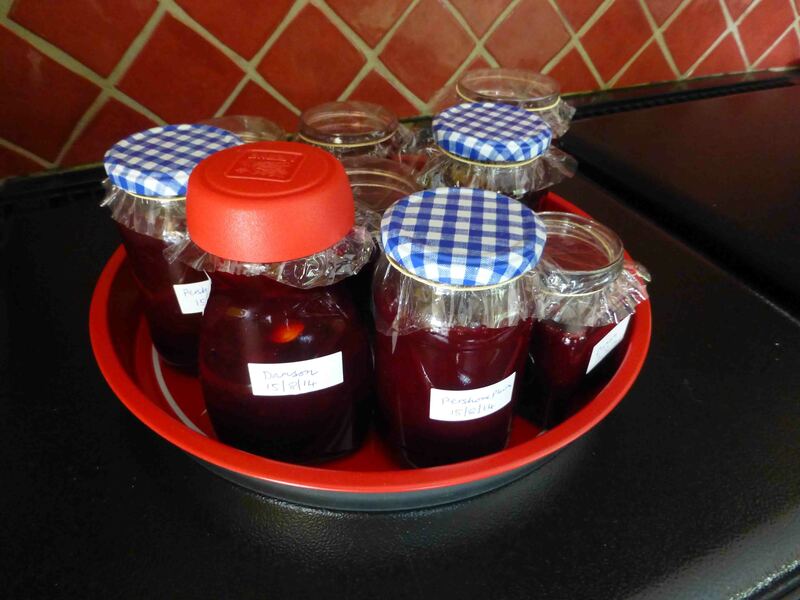 So we want some apples to eat straight away, some to use for cooking; pears to eat; plums and damsons to eat and to use for jam making. Replies to these emails were very useful and gave us a lot of information for our site. We were also able to research the different varieties to find out what the fruit was like. We chose the nursery who could supply the majority of our selection in one delivery. Also the nursery who had best answered our enquiry. The above lists show the fruit trees we bought and which are now planted at Springdale. As fruit tree labels break and blow away from time to time its useful to make a note of tree positions, which are shown in the table above. What does ‘rootstock’ mean and which to choose? The rootstock determines how big each tree will grow to. If you grow a fruit tree from a pip, the tree may grow to 5-6m high or taller. So it will not be easy to reach the fruit. If you opt for a dwarf rootstock, you can limit it’s growth to as small as 1.5m. Rootstocks are chosen and grafted on from a related species. This will restrict the growth to the size of the original roots and keep the tree to a manageable size. With this in mind we chose MM106 rootstock for our apple trees which means our trees will grow to between 3m and 4.5m. And for plums and damsons the nursery had rootstock St. Julien available. All the trees should then grow to roughly the same size, which means we can have regular spacing between all the trees and the fruit will not be too high for picking. You can find lists of rootstocks and their descriptions on most fruit tree sellers’ websites and then choose according to your available land and space. Allow plenty of room for the trees to grow in future years, by checking your rootstocks for height and spread. Mark out your land with canes to ensure there is the correct spacing for trees. 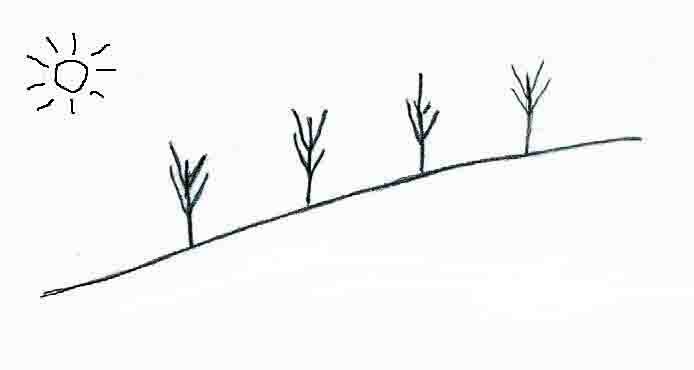 A bare root fruit tree will arrive in a dormant state. It should be planted as soon as possible after receiving it, but not if the ground is frozen. Dig a large sized hole at least a third wider than the roots. Hammer in a stake before inserting the tree into the hole to avoid damaging the roots. Dig plenty of well-rotted manure or compost into the hole. Fill the hole with soil around the roots and gently firm the soil in with the sole of your boot. This process removes air-pockets from around the roots. Secure the tree to the stake with a tree tie. If you have rabbits or deer in the area, you MUST protect the trees immediately. The trees will need protecting from the first night they are in the ground. Rabbits and hares are the most serious problem, as they will eat the bark and this can be fatal for the tree. The best protection is a plastic spiral tree guard. These can be easily removed after a few years when the bark is older and tougher. This entry was posted in The Orchard and tagged Bareroot, Fruit, jam, plant, pollination, protection, root, rootstock, Stake, tree on March 11, 2016 by debonland.